The Federal Reserve finally did it, hiking rates by 0.25% (25 basis points), with the upper bound of the target range of the overnight rate at 0.50%. The only interesting question is to see how the Fed intends to follow up on this hike, The interest rate projections published by the Fed are consistent with about a 100 basis point rise over the coming year, while there are 8 Fed meetings in 2016. The cleanest solution would be to hike rates by 0.125% every meeting, but it seems more likely that they would pause periodically. In a normal world, the only people that would care about this are a handful of interest rate traders and possibly some academics specialising in monetary economics (and people who like reading about bond market economics). However, there is far too much attention paid to monetary policy, and the importance Fed moves are blown far out of proportion. If this move has any significance, I would argue that it is bullish for the economy. The Fed is staffed with tons of economists, and is in touch with countless investors and business leaders. The fact that they hiked rates is a sign that they think the latest gyrations in risk asset markets is just the result of hyperactivity amongst market participants, and that the underlying economic trajectory is sound. (The fact that the upper end of the range is 0.50% means that it is not a resounding vote of confidence, admittedly.) Higher interest rates will have no measurable effect on the economy until they reach something like 4%. Finally, there has been a lot of analysis discussing the size of the Fed's balance sheet. This analysis should have always been ignored. The Fed currently pays interest on reserves, it is in line with the operating practices of the other major central banks, and those banks have no problems whatsoever of setting the overnight rate independently of the size of their balance sheet. Admittedly, there can be divergences of interest rates amongst differing instruments, but this only matters for those trading those obscure instruments. Let the Fed Policy Error Debate Begin. 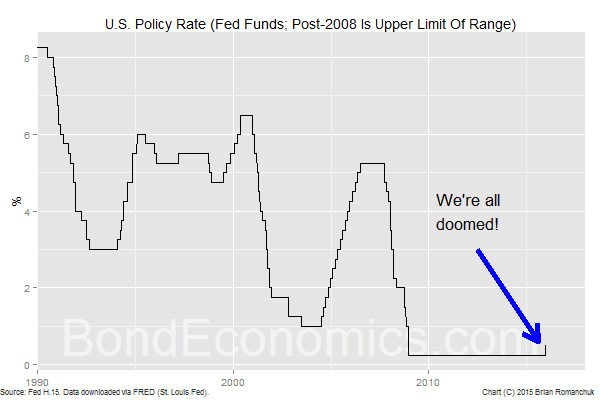 Gundlach is right, the Fed won't follow through its dot projection. Why would you conclude that the Fed won't be able to raise rates in the manner in which it has described based on the fact that the yield curve is flat? The more obvious conclusion is that the curve will steepen, and that the 10-year yield is too low. The 10-year yield isn't too low!. The bond market is worried about global deflation, not inflation. I think the bond market is right and the Fed isn't going to be able to raise rates as much as it wants without wreaking havoc on markets. I did not yet look at the Gundlach video, so I am unsure who you are responding to. If the Fed keeps hiking by more than is expected, the curve will flatten, but the whole curve would shift upwards in parallel at the same time, The net result is the standard response to a hike cycle -- a "bear flattening". I don't think that market hysterics alone can stop the Fed; there will have to be a follow through to data in the real economy. So far, there has been no follow through from junk bond weakness to the real economy (if we are willing to ignore business surveys, which are tanking). Therefore, I do not think we can phrase it as "won't be able to raise rates". In a world where german yields can rise 1% simply on comments from Bill Gross (a move that he wasn't even positioned for), I think you both drastically underestimate the risk of a sharp move higher in us yields at some point in the near future.